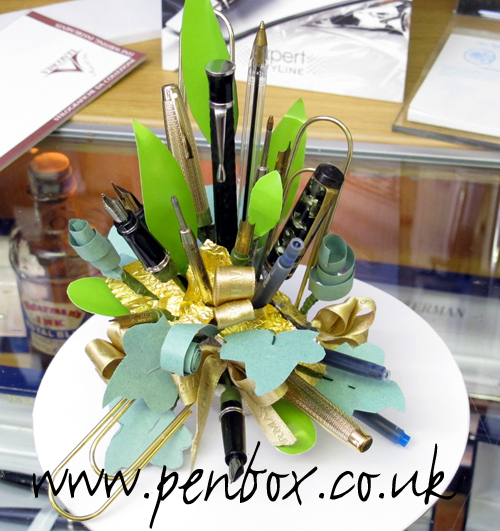 This is the unusual flower arrangement produced by a member of the Penbox pen shop staff in the Epworth shop when she was invited to take part in a charity flower arranging competition. Having rummaged around in the used bit boxes in the stock room she produced a winning entry and helped raise £178 for a local charity. Well done Debbie! 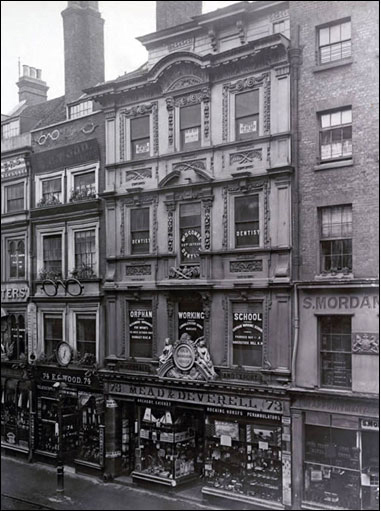 Spotted this old image of London and on seeing the Royal Crest and S. Mordan on the building on the right of the image I thought that it must be Cheapside, London, and the S. Mordan and Co. of silver and gold pencil/pen case fame. Photo brobably dates from the mid 19th century. This year Penbox’s Christmas window display features an illuminated Pelikan Souveran pen, Visconti Wall Street pens and old Waterman ink bottles. Inside the we have some special offers on pens for the festive season. Enamelled Metal Swan Ink Shop Sign. We were visiting the North Yorkshire Motor Museum over the weekend and noted this sign on the wall of the garage. Took this image with Annette’s phone/camera. The enamelled metal Swan ink sign was amongst other interesting enamelled motoring related signs.